This organza has been specially selected for the holidays. Organza is a transparent fabric that consists of polyamide and lycra. 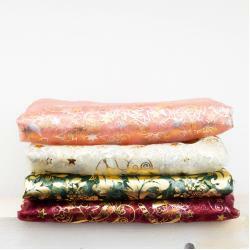 The fabrics are printed with fun and playful motifs such as a Santa Claus or golden decorative leaves. You can use the fabric as a tablecloth or with other forms of decoration.